I-65 is being widened from the Tennessee state line to Elizabethtown, KY. Palmer Engineering is working with two other consultants and was selected by the KY Transportation Cabinet to develop plans for widening I-65 to 6 lanes and for improving interchanges for 20.5 miles of I-65 in Barren, Edmonson, and Hart Counties. Palmer is responsible for developing widening plans for 6.3 miles from MP 51.0 to MP 57.3. 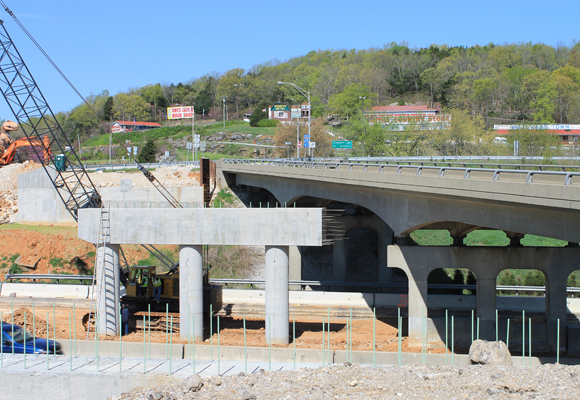 Palmer’s section also includes improvements for the I-65 and KY-70/KY-90 interchange at Cave City. The interchange will be improved to provide enhanced operational characteristics and the necessary horizontal and vertical clearance. I-65 will be widened to six lanes by adding an additional lane in each direction and then constructing a concrete barrier in the median. Numerous sinkholes on both sides of the interstate and at the interchange at Cave City necessitated erosion control and storm water drainage that provided natural filtration of runoff because they eventually drain into Mammoth Cave. Palmer Engineering also developed preliminary designs for three bridges.